On February 7, the DHBW Heilbronn hosted the internal symposium under the motto “Digital Transformation”. More than 100 professors and lecturers from the different DHBW campuses could be welcomed at the location who want to network on topics from research and teaching. Our project partner Florian Rampelt from the Stifterverband, among others, drew a wide arc between the past and the future about digitisation before the visitors set to work themselves in workshops. Two workshops were held about our projects OEPass and MicroHE: The first workshop on our Learning Passport, which is currently being developed as part of the project, was followed with great interest by 12 participants. Jochen and Raimund from the DHBW and Florian from Stifterverband provided an overview about the OEPass project and gave participants the opportunity to ask questions about the documentation and recognition of micro-credentials via the Learning Passport. The second workshop focused on micro-credentials within our project MicroHE. The central question of this workshop was to what extent it would be possible to establish small-scale educational qualifications within the structures of the DHBW within the next few years. 26 participants took part in this inspiring discussion. We would like to thank all participants for their great interest in our projects. 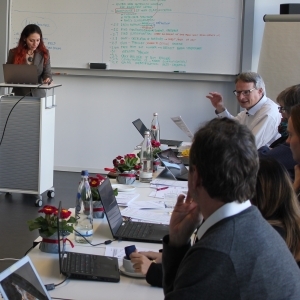 On the afternoon of 6 February 2019, we concluded an intensive, and highly productive, 2.5-day joint OEPass–MicroHE meeting in Heilbronn, Germany. Our host, DHBW, showed great initiative by proposing an innovative agenda and the unconventional meeting structure proved to be very beneficial. Just like last time, on the afternoon of our arrival we had an expert meeting to kick off the work. This time our guest was Darco Jansen from EADTU. Darco is the coordinator of the European Short Learning Programmes (e-SLP) project, another Erasmus+ funded project, the partners of which have already conducted surveys about short learning programmes. Their results have great relevance to both projects, particularly MicroHE, that is also foreseeing to undertake surveys and interviews to analyse the current and short-term scope of micro-credential provision and to identify barriers to their accreditation and recognition in Europe. After an exchange of introductions of project goals, plans and our findings so far, we agreed that – in order to maximise the value of our combined efforts and to avoid reinventing the wheel – the MicroHE survey will learn from and build upon the e-SLP findings and also feed back the lessons learned from our own surveys and interviews to e-SLP. On the first official meeting day, instead of sitting through a series of presentations, we were given time and space to discuss and fine-tune our project outputs in practical workshops. We still have some “homework” to do before we can pronounce the tackled outputs finalised, but we made greater progress during these few hours than for weeks beforehand. Especially since we all had different angles of approaching the same results, the constructive group work could bring all the partners to the same comprehensive understanding of the (multiple) purposes and functionalities of the outputs we are working on. Both partnerships were invited to each other’s meetings, and although not everybody could stay for all 3 days, Tuesday evening we had both OEPass and MicroHE representatives at DHBW’s premises to participate in the most entertaining part of the programme, the team building cooking activity. We had a truly international menu of 10+ dishes, including simple but amazingly delicious Lithuanian garlic bread, Indian curry, Finish casserole (with a Greek twist), Italian gnocchi made from scratch, German apple strudel and a heavenly Hungarian dessert. Since the project started in November 2017 this was the third time the consortium met face to face, and this time it was KIC’s turn to host the partners in Malta. After an expert workshop held on Monday afternoon with 0xcert CEO, Kristijan Sedlak, and the subsequent consultation with the MicroHE partnership, we gained a very exciting and useful insight into how blockchain technology could potentially support our our efforts in semi-automated credential verification and recognition in a secure decentralised online environment. If you would like to know more about the meta-data standards utilised to facilitate the working of the MicroHE Credentials Clearinghouse, we invite you to participate in the public consultation set up on Github. By the end of the meeting we wrapped up the internal testing phase of the OEPass Learning Passport, and after having discussed the conclusions, and producing the second iteration of this promising tool, a small team prepared a session to test it with the 2018 EDEN Research Workshop participants on the 25th of October. We wish that this will be an important step towards making the recognition of open learning a reality across Europe. The workshop in Barcelona is only the start of the Learning Passport’s public testing phase, please let us know if you would like to participate.